A war memorial is a building, monument, statue or other edifice to celebrate a war or victory, or (predominating in modern times) to commemorate those who died or were injured in war. We also have a War Memorial in KGF near the Central Telephone Exchange and the Central Workshops. 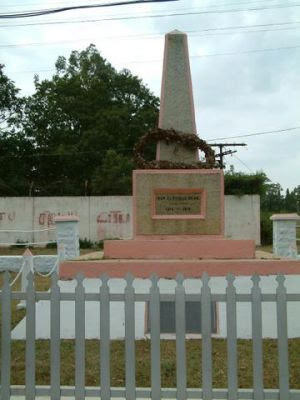 Not many from Kolar Gold Fields know about the significance of this War Memorial. This Memorial was erected to commemorate and remember the members of the armed forces who were killed in the line of duty during the First World War. These brave people are remembered and commemorated on the 11th of November every year on Remembrance Day. Remembrance Day or Armistice Day was specifically dedicated by King George as a day of remembrance for members of the armed forces who were killed during World War I.This day is also known as Poppy Day as some of the worst Battles were fought in the fields of Flanders. Bright Red Poppies later bloomed across these battle fields and their brilliant red colour became an appropriate symbol for the blood spilled in World War 1. The Red Remembrance Poppy therefore became a familiar emblem of Remembrance Day due to the poem "In Flanders Fields”. In earlier days a grand Memorial Function was held every year at this War Memorial in KGF. However after the Mines were nationalized and the Government took over, the Ex Servicemen of KGF would generally gather on their own and pay tributes to the martyrs who laid down their lives during World War 1.